High-quality images are an attractive addition to blogs, websites, and even social media posts. However, they take a long time to load which can often wary the visitors in moving on to other pages. Fortunately, Google has introduced a new web app “Squoosh” which makes the task easier. The app is user-friendly and offers easy drag and drop features making the task more convenient. Within the app, you can choose from the different compression options including MozJPEG, OptiPNG, and Google’s WebP. Dual sliders are also available to adjust the level of compression and witness the effects respectively. Other advanced options are also integrated allowing users to create decent images without compromising the quality. "How buttery smooth can you make your web apps today? Especially if you have non-trivial workloads? Our team set out to explore just this, and the end result is a new application launching today called Squoosh. This powerful image compression tool launches almost instantly, and then manages a smooth UI even when it’s doing heavy work, including using Web Assembly to do more with codecs the browser doesn’t have baked in." the team from Chromium wrote in a blog post. 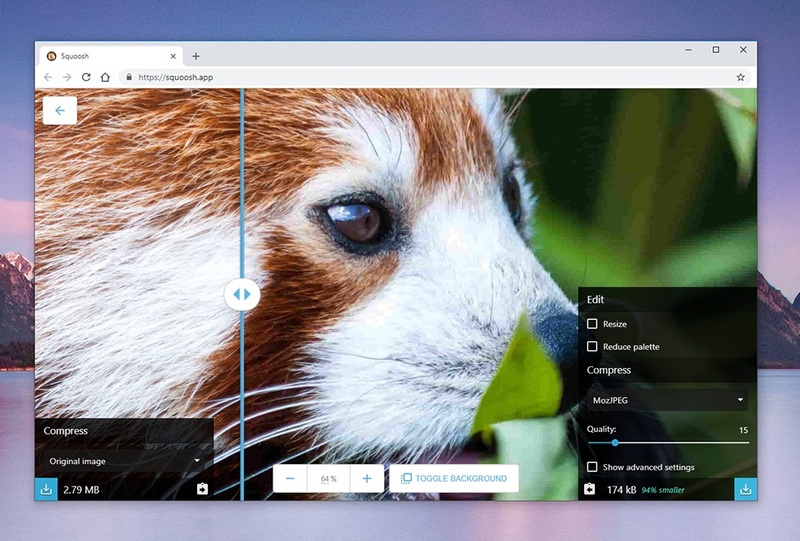 Currently, Google's Squoosh app doesn't support bulk image processing and direct web images/url compression features, yet it can be a worth-bookmarking tool for web developers and photo editors to try.